Discussion in 'Made with GameMaker' started by Didjynn, Nov 14, 2018. Do you like Pong ? Do you like Flipper (the game, forget about the dolphin) ? Suprapong is a mix between both and even more. You move around a circular arena and both sides of your raquet can smash the ball, improving it's speed but also changing its direction to trick your opponent. Because it wasn't enough, you can also use... powers ! Freeze your opponent, create bumpers, protect your side from any ball for a short time... you can choose them before the game start. Choose the game mode, Suprapong let you be more strategic, Bomb also (especially with more than one ball) and if you are looking for action, try the Chaos mode ! Play in local with your friends up to 6 players. Customise your player, change your colors and graphic patern, select the skins you unlocked by leveling up. Change the rules of the game at will. The game is waiting for the final Steam validation, it will be out for sure this month. Of course shares are much appreciated. Thanks for reading me and cheers ! SnotWaffle Studios and Vether like this. Local multiplayer up to 6 players, you can play alone but the IA isn't here to make you live the game of your life. Get some friends, give them a pad and you'll have a good party night. We are trying to make online multiplayer but it's tricky, any lag would break the game and the fun. We did it ! 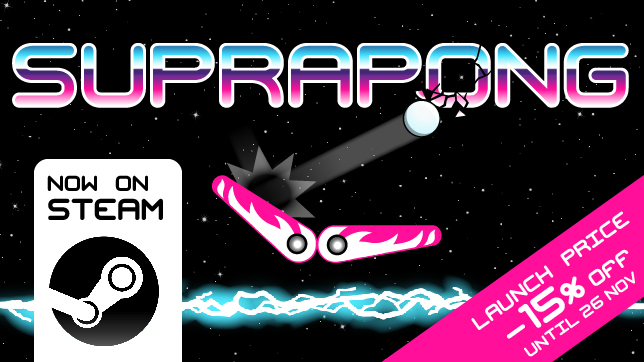 Suprapong was finally released on Steam last night ! Invite your friends, plug your pads and get ready for some well spent time. Don't miss your chance to get the 15% discount ! This looks amazing! Very unique. Seems like a fun couch-multiplayer game to play with friends. It'd be dope on console!! Great job. This looks fantastic. I'll definitely be giving it a shot. Would love to see a Switch release if possible! Update: I've now downloaded and started playing the game. So far it's fun, but you desperately need to get some customizable controls into the game. ZQSD might work fine on an AZERTY keyboard, but it requires mild finger contortions on a QWERTY keyboard. I hope you play with your friends, that's the purpose of the game. If your internet is good enough, you can use Parsec to play online ! Love the idea, love the look. We will make a stream with the parsec team january 11 at 10pm EU (4 pm USA West side). We will play with players joining us with parsec. I hope to see some of you !